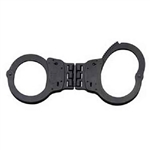 ASP Double Closed Top Handcuff Case holds two ASP cuffs within easy reach. Constructed from a bench made blend of the finest material in a series of clean, functional design. The closed top cover secures your handcuffs within the case with a hook and loop closure. Built with elastic side walls to securely hold either ASP chain, hinge or rigid cuffs. Cuff Case also includes forged handcuff key, which resides in the hidden key pocket on the back side of the case.